I started this book on a plane. The first chapter chapter takes place on a plane. There was also a "news" story just out about a passenger being bitten by someone on a flight to Ireland. (Has anyone seen any news out of Ireland lately?) I will say from then onward there was little suspense. But that is ok. It is after all a zombie novel. We know what happens. I like the uniqueness of this story, I like that it takes place in Canada. I like that it takes place in winter and enjoyed the descriptions of the dead. I live in an extreme winter environment and felt the author got it right. There is a decent plot twist. And I like where we end up at the end. I just wish that it wasn't a first in series. Not sure if I liked it enough to continue on. But that is just me, I am yearning for some solid single book stories. If you like the genre, I would suggest checking this one out. It takes us places we haven't been before. REVIEW: AIN'T NO GRAVE [THE PENANCE OF LEATHER #1] by S. A. SoftleyA search for literate end-of-the-world narrative will lead you right here, to AIN'T NO GRAVE, in every aspect far from the usual routine apocalyptic. AIN'T NO GRAVE is creatively imagined, lyrical, and thought-provoking. It ought to be on the bookshelf of every aficionado of The End. I was given this book by the author in return for an honest review.S.A. Softley is a canadian author/musician, and as far as I've been able to find out, "Ain't No Grave" is his debut novel.I've read a stunning number of dystopian and apocalyptic books over the course of the last couple of years and when the author told me he was inspired by one of my personal favourites; "The Old Man and The Wasteland", I looked forward to reading his book to see if he could cut it... so many of the apocalyptic books these days are just churned out to get a piece of one of the trending genres - and it's getting harder to find the really good ones among them. 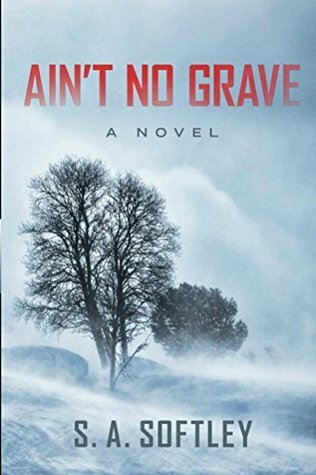 Thankfully and honestly "Ain't No Grave" turned out to be one of the good ones.First of all, Mr. Softley writes really well. His language is rich and flows easily. There's real depth in his writing, and his style makes the experience really enjoyable.He gathers inspiration from books like The Road and The Old Man and The Wasteland, and mixes in large portions of Fallout and old sci-fi stories. He then gives the whole zombie-genre a little twist with the way people get infected and most importantly; how you can kill them.But the main story here is the story of our protagonist. The point of the book is to tell his tale, and there obviously being plans for more from this series - it does really well to lay a solid foundation for the upcoming books.I like stories which are character-driven, and that is what this book is all about. How would you react if you're the last person on earth? Our hero isn't that all out killing-machine US Marine that so many books are riddled with these days. He's an claustrophobic outdoorsman, with common sense and a wish to find out what happened and why. It's also good to find an author who actually can write about cold scenery. Being Canadian, I assume Mr. Softley has actually experienced real cold, and it's easy to see how he's using that to his (and his heros) advantage. The only thing I have to draw a star for is that the story can in portions get a bit to slow paced and seems to want to go in circles. I could wish for a bit more background on our main character and our hero IS a bit too slow at understanding what's happened to him. I get it that he's in shock and obviously in denial, but there are a few details (especially the relationship with Megan, who is just a bit to accepting to my liking) that throws me a bit off at times. But this is storytelling, after all - and it's not anything to hold anyone back from reading this. I do love the part about Megan, though - and the way music is woven into all this. (Check out the authors website, where he's posted the title track from book - and the song our hero and Megan shares..)All in all; a really exciting new name in apocalyptic and dystopian litterature, and a name I'll keep up with, that's for sure. Thanks for the ride, hope to hook up with our leathery friend again soon. This is the dark, introspective journey of a man who is forced to accept that civilization has crumbled after awakening in a deserted hospital. He has to deal with the psychological implications of a global disease that has created zombie-like creatures and left him feeling utterly isolated and alone. There are immediate physical problems of the freezing Canadian winter, the hungry walking dead, and the basic logistics of surviving, but long term he has to come to terms with how fast humanity was destroyed. Facing the harsh reality of his situation brings problems and torments, as well as romance, friendship and new purpose.Despite the apocalypse, he manages to connect with two people; Megan, a singer who brings music back into his life and gives him hope for the future, and Lawrence Ellison, a wise old farmer who is already accustomed to isolation and solitude. Lawrence offers some very useful skills; but they will require both physical and emotional fortitude. All three characters were well written, with deep, believable personalities, although the novel is very much about the present, with the past only briefly explored.Our protagonist is a little slow perhaps, a little stubborn in his thoughts when it comes to forming conclusions - clearly in denial for a long time. Slow to start, I found myself reading faster and faster and ended up devouring the pages. This isn't an action-packed zombie slaying fest, it's the harsh psychological reality of surviving in a world that has so drastically changed, with a little twist thrown in to give the book a unique perspective. This is an author that I'll definitely be watching - I just hope we're not kept waiting too long for book two! I would like to thank S.A. Softley for the review copy of this book and award it 4.5 stars. After a bunch of successes picking up Kindle books from new authors, I decided to give this one a try. Maybe it's a bit altruistic, but I love the idea of supporting an indie author from the beginning and living vicariously through them as they rise in ranking and success. I have no doubt that this will be one of those authors.This book is very well written. I love the short, decisive style of the main character's voice. The author describes the setting with detail and artistry, but also leaves a good deal to the imagination. The author is a great world-builder. The world is revealed slowly and you really get into the main character's head to see it as he sees it. Just as the book description says, this book is clearly inspired by other post-apocalyptic books, but the writing style, characters and story are completely unique (well, I've never read another book quite like it at least) and well written. I can also see the influence of westerns like Clint Eastwood's "Man With No Name" series where the hero is flawed and seethingly quiet, yet capable and expert.I also took a few Greek and Roman studies courses in University, so I found it interesting that the author mentions in passing the influence of the Hercules myth. It's so slight that it's almost not there, but if you know what to watch for, you can totally see how the author has used the Hercules myth in his story.The character of Meg (Megara is Hercules' wife), the influence of a disapproving, harsh semi-omniscient parent (the memories of his father being Zeus or Hera interchangeably), the Lioness mentioned in the first chapter of the next book in the series (the invulnerable Nimean lion). It's a really cool take on that legend.I loved the contrast between the exciting action that keeps you reading and the ominous, quiet and atmospheric sections that set up the world and make you feel tense and short of breath.In short this is an expertly written novel and I look forward to the continuation of this series. The setting makes for a unique and original apocalypse with a multitude of possible directions. The characters are rounded and well crafted. In particular, the twist at the end of book one will make for a fascinating new hero with strengths and weaknesses worthy of superhero status. The possibilities for the follow up stories will be endless and, I'm sure, will result in something that has never been done before.I will absolutely be among the first to purchase any new novel from this author. First I have to say I was given a copy of the book by the author to review.I really wish Goodreads would let you give half stars because this book is actually pretty good for a first time author. I would give him 3.5 stars. And I think a lot of people would give him four, but I'm a tough nut. His writing is clean. He keeps you in suspense. The plot and story are a fantastic idea. I enjoyed the book. I probably would have read it in a day or two, but that pesky thing called life kept getting in the way. As we are moving into cooler weather, this would be a good weekend book by the fire as the book is set in the cold, cold winter in Canada. Grab yourself a cup of cocoa and dig in.Now here is my beef - The book does repeat itself some. I found him telling me something I already knew from a chapter back. BUT and I say this with a BUT, I notice a lot of authors do this. Just not my thing. Usually once I read it, I remember it so repetition can be a little bug in my ear. I think if he can get himself an agent and a good editor, he's got a hit. If you like end of the world zombie books - you will like this. Spoiler alert - stop reading if you don't want to know anything else. Go buy the book now. Because I am about to give away a few things. What Mr. Softley has done with his story is take the classic tale of a common man with family issues (mainly father) thrown in some quirks (fear of closed spaces which in the end creates an interesting conversation about heroes), guy falls in love, loses girl, goes on a find himself trip, meets Obi-wan(Old man who helps passing stranger) and becomes a new super hero. The follow up books (which he has set up nicely) would make great graphic novels. This first book to me is really more back story. It tells us how the hero got to where he is, which we haven't read because the book hasn't been written. He could almost use the first book as more back story - make the second book the first book using what he has written. Start it out with our tall dark stranger and the people he will save and slowly give us back story.Just my thoughts.Either way, it's not bad. Not bad at all. This is a good read. An interesting twist for a post apocalypse survival story. The writing was well paced, driving the story forward with unexpected twist and turns. In a world bereft humanity, it is the human condition that survives to light the path to the future. First of all, thanks to the author for sending me his book in exchange for an honest review.Actual rate: 2 and a half star.It is quite good written for a first novel and an indie author. I have read internationally published zombie books that are worse than this one. I love the zombie sub-genre since I can remember. The original Night of the living dead is one of my all time favorite movies and I have seen many, many zombie movies and read many zombie books and comic books.I really wanted to like this book and support the author, but I had several problems with it.The book is very well written and it is easy to read, but I somehow couldn't get into the book or feel any empathy with any character.Although the story begins right away, my main problem with this book is that I had the feeling nothing was happening and what happened was very foreseeable. I think I know what the author was trying to do, but it didn't work out for me since I never had the feeling that they were in danger at any time and there is no tension (besides a forced sexual tension), no horror and no action.The parts where something actually happens besides sitting around are very well executed, but they are few and scarce. The book works as an introduction of a story that will develop in the next books, but I had the feeling it was way too long for this purpose. It has a lot of potential for the next books, which I will be reading. I read recently that when writing a story, you should start it as late in the story as possible. I haven't decided how I feel about that advice, but I know that Ain't No Grave could have benefited from it.Softley has an interesting story buried in here, but the central character doesn't have what it takes to make his own origin story compelling. This story could have and should have been parsed out and condensed into a few flashback scenes in another book that was about more than just the central character ruminating on silence and making up to five metaphorical comparisons about the same thing, sometimes in a row. In fact, if Softley would have limited his metaphors to one at a time, AND eased the pedal back on his Hi Def descriptions, this story would have been the length of one long flashback. While this book was definitely in the zombie genre, it was far from the standard zombie novel. In fact there is very little zombie hunting/killing going on. Instead you get strong character development and great writing. I really enjoyed the survival aspects of the book. Scavenging for the supplies that the protagonist will need to survive the coming apocalypse. The book kept me interested throughout. You always suspected what was going on with the protagonist but it never felt like you knew so much you should stop reading. Overall a great read. This is a unique take on the Zombie theme with a twist I saw coming early. There are some inconsistencies that were mildly annoying but over all a readable book. If I am not mistaken it's the first in s planned series. Well, that was different! I must be slower than the other folks who have read this book, because I didn't figure out the big secret until Ellison told him. The tanning process made my stomach churn, I'll admit. I wish we had learned how Megan died. Did she catch it from the main character? She must have right? There was a lot of attention paid to surviving in the town, which I liked. But I admit there were times I wanted them to just hurry up and leave. However, I stuck with it and found the second half of the book much easier to read. (Except for the tanning) The pace was generally good, the plot well thought out and rounded out with a twist or two. I cannot recall ever reading anything else similar to this book. and that's big for me, 'cause I'm tired of reading the same old thing.I got my copy as a freebie for review, but I'll you honestly, if I had paid for it, I would be just as happily, morbidly enthralled. I may have nightmares tonight, but this was a damn good read. I really enjoyed this unique zombie story.The tale of a man who is a sentient zombie doing penance is intriguing.I found the authors portrayal of the characters struggle to understand his predicament interesting and engaging.I received a copy of this book from the author in exchange for an honest review. What a weird book. But, I liked it anyway so...This book gave strange feelings, some no-way-is-this-really-happening-weird kind of vibes lol.